When one finds himself at death’s gate, he will be reviewing in a blaze all habits and desires of his whole life. So quickly he will be overwhelmed by one desire or feeling that will be in accordance with his life’s character. He might have feelings predominantly happy for doing good deeds or guilty for doing evil actions or a feeling of being predominantly worldly for all his material actions. The dominating feeling will determine where and which particular region of the astral world he will be directed to and similarly after that, to another appropriate incarnation back on earth. At the last moment of a man’s life his thoughts will determine what his status is in the hereafter. In realizing their oneness with their creator individuals can become inwardly free from the apparent troubles and ills of this dream life. They behold loss and gain, sickness and health, life and death, merely as fascinating chapters of the dream creation. How foolish it would be to presume such aboveness until the person actuality knows for certain without a doubt that all matter is energy and that energy is nothing else but the thought of God. However, if that person hits his dream fist against a dream wall it will get him a dream fracture. Man’s cross to bear is his body and he must do it bravely by mentally rising above its difficulties. Our creator is dreaming through us and our own nightmares are included with His dreams making everything seemingly real. What are the metaphysics of life and death? Death transitions our soul from the physical body to an astral one and then the astral body transfers to the beautiful luminous astral world. What does it feel like when you die? Did you know that most people fear dying because they were told that it will be painful? Why is man so stricken with horror and grief when he senses himself nearing or seeing death? When death arrives like a cruel tyrant it is very difficult for an individual to maintain a mental equilibrium when he feels his peace and harmony will be destroyed. It is not so hard for someone to give up an old overcoat when he has the chance of getting a new one, but because of deep attachments to their possessions, some people find it impossible to throw away even old used garments. Likewise, mundane people grieve when they are being ousted from their dearly loved bodies. Do you want to live with apprehensions? As long as you are alive you are not dead and when you die there is nothing to worry as it will be all over at least for a while that is. When we die it is totally devoid of pain. When you go to sleep at night you do not feel any pain and when the last sleep finally comes there is no pain. As sleep expels the aches and pains of the hard worked day, death voluntarily releases us of all bodily pain and suffering. 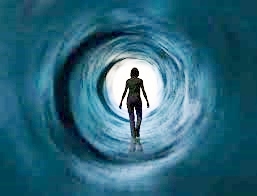 Death does not come as a punishment, but is the cessation of all of life’s sorrows as a essential finish to our bodily confinement and that our souls may depart this earthly realm and journey in a freer form to higher regions. The body may be buried or reduced to ashes in cremation but, the spirit will no longer be subjected to the torments of the body. Oh… what a relief for the soul is now free in a body of light in the beauty and peace of the astral spheres with no more bills to pay or worries about getting injured or sick. What happens when you take your last breath at the moment of death? In breaking down the various steps of physical death, there are stages that occur in the body in this way. When the life force ebbs away from the muscles, the motor nerves becomes paralyzed and because of deterioration to the sensory nerves they are unable to reach the brain and because of paralysis the deteriorating man is unable to taste or smell. The optic nerves begin to fail and the dying man is unable to see and deafness sets in as the auditory nerves are cut off. The dying man will no longer be able to feel his body when the tactual nerves stop working. Do you remember the sensation when your arm or leg has gone to sleep? You could see that limb, but you could not move it and that is what happens to the dying man; he is aware of his dying body but because of paralysis he is powerless to move it. When all of man’s organs become paralyzed, death is not yet complete even though the lungs, liver, and heart have stopped working as well as the limbs. The dying man has no experience of pain during this slow-moving paralysis except for the lungs. This is the only organ that can cause pain in the form of suffocation, but this pain can only be felt mentally. There is definitely mental pain or terror for those who fear losing their physical body and who clutch to it in utter panic when life is ebbing away from the bodily frame as they resist unsuccessfully to keep on breathing. This is the same as a nightmare where one feels stifled or muffled with the thought of being asphyxiated. This mental agony is gradually dwindled away anesthetized with the hypodermic of unconsciousness. The majority of time even though man breathes constantly he is not conscious he is breathing as it is with the wise spiritual man throughout the death experience. When the lungs become paralyzed the spiritual man will not feel any suffocation because he realizes that the soul is not conditioned by breath. It is the opposite for the spiritually ignorant who thinks his life or soul depends upon his breath therefore it is he who will suffer the mental pain of suffocation. This is the fate for those who do not meditate but those in the inner circle, the practicing lesson students of the SRF and others are learning the technique of pranayama or the art of breath control which guides the vital force of breath (pranayama) leading to soul consciousness. Some need to hear this over and over for it to sink in that the real battle, the great enemy you find facing your soul is breath and emotions, the greatest enemy of the devotee. We will learn how we can alter our states of consciousness by the way we breathe. How through the science of pranayama the regulating motion of inhalation and exhalation will gradually let you experience different states of consciousness which the rest of the world cannot perceive through meditation. Breathlessness is the technique which makes you immortal and until we realize our own immortality we will have to reincarnate again and again. That is why the master says through breathlessness a new world of perceptions open, the soul is released from its bodily cage without the mental agony of mental suffering and enter the astral world at will. Therefore you become more intelligent and remember that the totality of a human life is man’s preparation for his final examination at the time of death. Do you want to exit your body at the time of death unconsciousness or consciousness? It is your choice. However even the advanced spiritual man dreads losing the mortal body and he temporarily forgets he is the immortal soul. As the falcon of death swoops down onto the bird (man) to release him from his bodily cage the bird screeches in sheer terror mentally as he is paralyzed by the grip of impending death. Wait, stop, is this how it is supposed to be when the bird of eternity is locked up in a fleshy little cage? We should be eagles of immortality feeling at ease in never-ending space. Unfortunately when a bird is long confined in a cage even if set free may still want to return, likewise when a man is so attached to his bodily cage he desires to return even so after being set free by death. Caged and imprisoned for so long the bird has forgotten the freedom it had in the skies. It is the same with the soul imprisoned in man’s body through many lives; it loses its memory of home in the vastness of space. In the astral worlds there is no coffee and toast; no lunch or dinner; no air, water or sunlight. Those who are unattached to the body, soon realize their newly won freedom upon leaving the body and how their soul is no longer bound by food, water and air. From the yoga training in meditation only those who have consumed less carbonizing food and have experienced control of the breath and heartbeat can consciously experience death. To the great majority of people who have not learned the art of living by direct life-energy as the noble and exalted yogis of the east, you can start by stopping the attachment to the attention of the body. Learn to care for your body with non-attachment. Worldly men have no idea what the soul is or how it comes and goes into the physical body. Those who fear the cycles of life and death and what these experiences will hold will have this explained over and over until they get the point. Unless man overcome these fears, repeat incarnation is in order until knowledge is gained on how to overcome them. Do not ever seek death; only a coward is afraid of learning life’s lessons. Death is freedom and the greatest happiness from all the agonies and suffering of the flesh. For exact details of the astral world, read chapter 43 in the book titled “Autobiography of a Yogi” by Paramahansa Yogananda, a spiritual classic.